This entry was posted in Spotlight, Watch reviews and tagged Casio DW7200, Casio Pentagraph, Referee Match Timer, Vintage Casio. Bookmark the permalink. Hi, yes the Casio Pentagraph is indeed rare. Believe it or not I have one too, in “As new” perfect condition. Mine still has the original strap, but its not rubber. Mine has a tan brown leather strap which I feel is a better compliment to this watch. I also have the paper instruction booklet that came with it.It cost £65 when it first came out nearly 30 years ago. No idea what its worth now. I don’t wear it any longer as it has no back-light and my eye sight cant make out the dials but my girlfriend at the time bought it me for my birthday. It must have worked as she is now my wife. Hi and thanks for your comment. Nice to hear of another Pentagraph even without the backlight (maybe just a battery needed)and interesting to note that you say the leather strap is original. 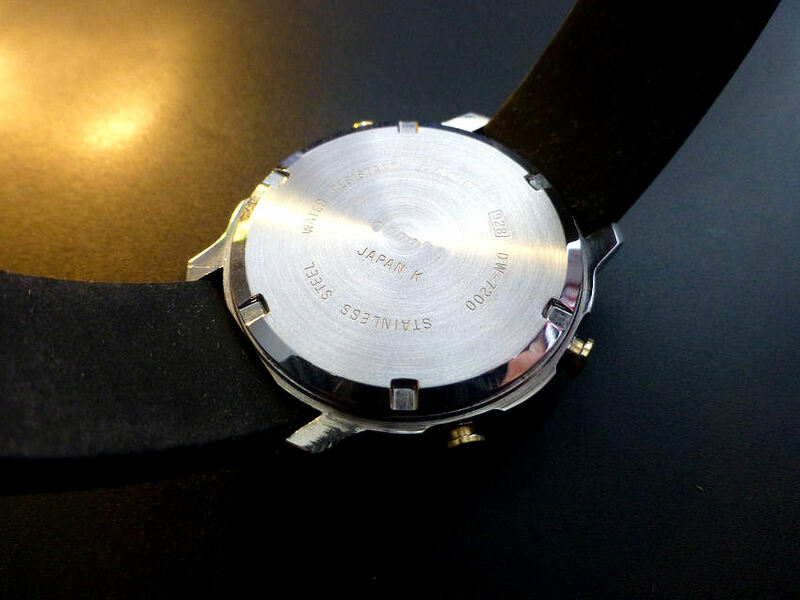 This seems unusual, whilst models did appear with resin, rubber, composite resin/steel and steel bracelet – I have never seen one with an original leather strap. 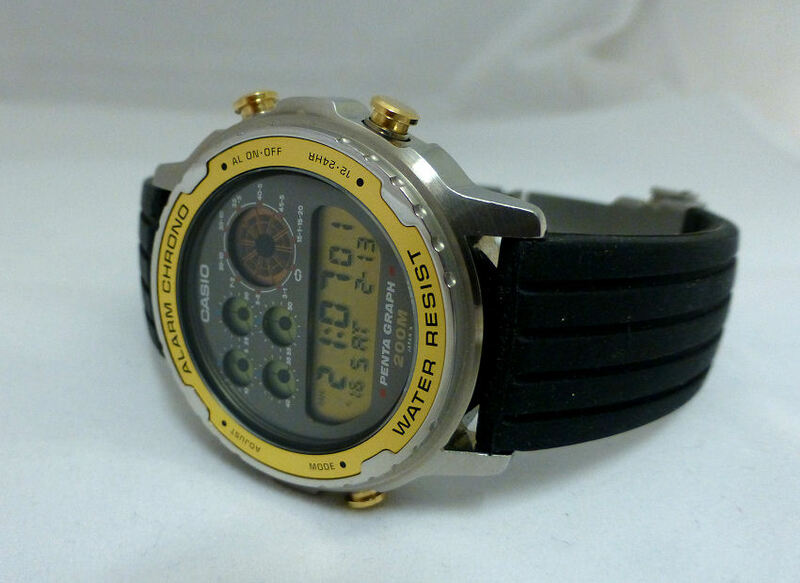 The reason I say this is the watch was advertised with the 200M Water Resistance as a named feature and leather or even webbing would not have been the best choice unless oiled and water proofed, but who knows? Anyway I still wear mine often and I love the fact it draws comment every time. 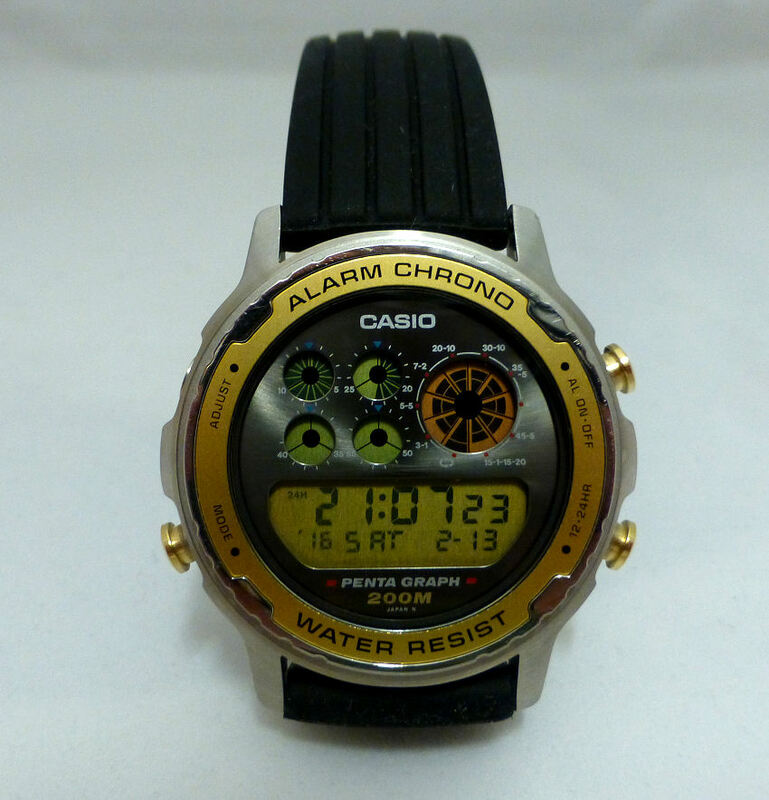 So yet another well designed and good looking Casio model from those days that still looks good today. Hi, I have just recently set about restoring my DW-7200 and when I replaced the battery I found that the beeps and alarm sounds do not work now. Do you know off hand if this model had an alarm spring? I remember it had a standard Lithium 2016 battery and there was a frame spring contact which contacts with the screw back. Other than that I can’t recall anything else. I attach here a link – http://watchcentereurope.com/p466377681/h9fe8ea3f#h9fe8ea3f which shows this model with the back removed. You can see the case back spring contact at the left. I can’t recall anything that would prevent the alarm beeps from working – (apart from making sure the new battery is actually OK and not a bad one! ).